Fifty-nine chapters are included in this volume. Anatomy and Physiology of the thyroid and parathyroid glands and the salivary glands are discussed in detail, along with head and neck imaging and sentinel node biopsy. The specific disorders covered include non-melanoma skin cancers, melanoma, thyroid cancer, goiter, hyperparathyroidism, salivary gland neoplasms, soft-tissue and bone sarcomas of the head and neck, cancers of the oropharynx and oral cavity, and many more. Separate sections discuss reconstruction of the oral cavity, hypopharynx and larynx, maxilla and skull base defects, and the scalp, as well as facial transplantation. 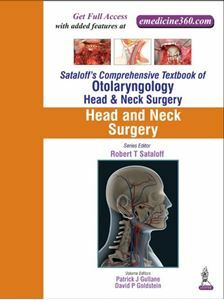 This volume is a thorough guide geared toward practicing otolaryngologists and otolaryngology residents, and fellows performing head and neck surgery.